The Rochester Knighthawks announced today that draft pick Leland Powless has signed a one-year deal. 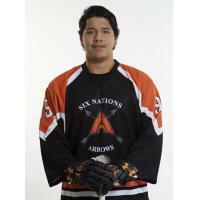 The 21-year-old forward joins the Knighthawks from the Junior "A" Six Nations Arrows. "It is actually happening now," said Powless after agreeing to his first professional contract. "I am a part of a winning team, and I want to keep it up." On Draft Night, Leland learned he was a member of the Knighthawks by watching the live-streamed event from his home in Onondaga Nation. Joining the Knighthawks family has deep meaning for Leland, who is the cousin of former Rochester head coach Barry Powless and past player Neal Powless. "I was sitting there watching it and (when I heard my name), it was a dream come true," said Powless. "I just want to keep it going and help the team out the best I can." Rochester used its sixth-round selection in the 2018 National Lacrosse League Entry Draft to take Powless, who is coming off an impressive first year with Six Nations. During the summer season, he posted 17 goals and 28 assists for 45 points in 17 games. During the postseason, he chipped in two assists in three games. Knighthawks assistant coach Marshall Abrams, who coaches the Arrows, was impressed with Powless' versatility. "It was his first year in Junior 'A,' and he surprised me a lot," said Abrams. "He can do everything; that's what I like about him. He is a good defender, he is outstanding between the lines and in transition, and can play 'O.' Someone versatile like that can find a place in this league if they work hard. He has a lot of work in front of him, but the potential is there. I am excited to see how he does against pros." Rochester loaded up on forwards with it final three picks and Powless was too good to pass up when it came time for the Knighthawks to make their final selection. "What I noticed about Leland was that he was a very unselfish lacrosse player," said Jacobs. "He has a good head for the game, sees the game well and makes good decisions. Those are things that caught my eye. When we were coming to the end of the draft, everybody seemed to like him. He's a type of guy we are looking for on our right side and has the potential to make the team. We just thought it was a good pick." Before his stint with the Arrows, Powless played for the Can-Am Onondaga Redhawks in 2017. His career also included a two-year stint with the Junior "B" Seneca WarChiefs. In his first season with the WarChiefs, Powless appeared in the 2015 Founders' Cup. That same season, the crafty forward played in the Senior "B" President's Cup and finished sixth on the Snake Island Muskies in points. Knighthawks Owner and General Manager Curt Styres followed Powless' progress this summer with the Arrows. From his perch behind the home team goal, Styres kept tabs on the young forward as he played alongside his son, Bo, with the Arrows. "Leland played for the Six Nations Arrows and had a pretty good year," said Styres. "He can really shoot the ball. He'll be pushing guys for a spot." Powless will join the Knighthawks later this month as the team opens training camp in Six Nations. "I am as excited as I can be," he said. "It is everything I have ever wanted. Growing up, I wanted to be a professional lacrosse player. I achieved that goal, but this is just the beginning. I still have to put in the hard work; I am going to do that until training camp starts."